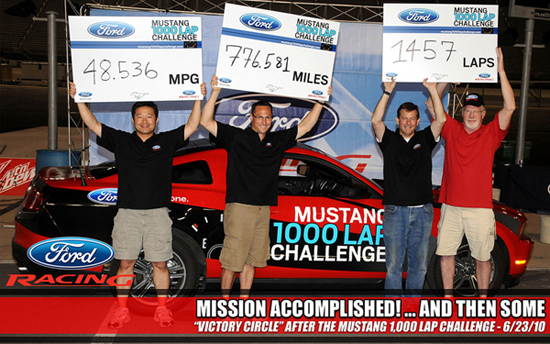 Ford completed the Mustang 1,000 Lap Challenge in the wee hours this morning at the Bristol Motor Speedway. It started at 7:00 am on Wednesday, June 23rd and ended just after 12:40 am this morning. The Mustang averaged 48.536 miles per gallon during the 776.581 miles and went just over 1,457 laps! All that on one tank of fuel! And the winner is………(will insert name here)? 24 people guessed that the Mustang would go 1,457 laps. One of those 24 will be randomly chosen today to win their own, 2011 Ford Mustang V-6. Visit the Mustang 1000 Lap Challenge website for videos and information! 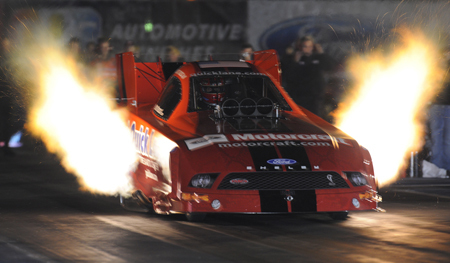 Ford Mustangs are dominating the NHRA this season! An incredible year for the Force Racing team and this weekend TASCA Racing took the top spot in the 41st Annual NHRA Super National Final with the time of 4.107 seconds. That is a lot of real estate in a very short time!